The peoples of Europe have had a tremendous effect on the development of the United States throughout the course of U.S. history. Europeans "discovered" and colonized the North American continent and, even after they lost political control over its territory, their influence has predominated due to a common language, social ideals, and culture. Therefore, when endeavoring to understand the history of the United States, it is helpful to briefly describe their European origin. The first significant civilizations of Europe formed in the second millennium BCE. By 800 BCE, various Greek city-states, sharing a language and a culture based on slavery, pioneered novel political cultures. In the Greek city of Athens, by about 500 BCE, the male citizens who owned land began to elect their leaders. These elections by the minority of a minority represent the first democracy in the world. Other states in Greece experimented with other forms of rule, as in the totalitarian state of Sparta. These polities existed side by side, sometimes warring with each other, at one time combining against an invading army from Persia. Ancient Athens is known for its literary achievements in drama, history, and personal narrative. The individual city-states did not usually see themselves as a single entity. (The conqueror Alexander the Great, who called himself a Greek, actually was a native of the non-Greek state of Macedon.) The city-states of Greece became provinces of the Roman Empire in 27 BCE. The city of Rome was founded (traditionally in the year 753 BCE). Slowly, Rome grew from a kingdom to a republic to a vast empire, which, at various points, included most of present-day Britain (a large part of Scotland never belonged to the empire), France (then known as Gaul), Spain, Portugal, Italy, Greece, Turkey, Iraq, Palestine (including the territory claimed today by the modern state of Israel), Northern Arabia, Egypt, the Balkans, and the entire north coast of Africa. This empire was maintained through free-born or adoptive citizenship, citizen education and indoctrination, a large and well-drilled army, and taxes directed by a large bureaucracy directed by the emperor. As each province produced more Roman citizens, the state became hard to maintain. Whole kingdoms in the north and east, and the invading peoples we know as the Germanic tribes (the Ostrogoths and Visigoths and the Franks) sat apart from the system. After the death of one emperor in 180 CE, power struggles between the army and a succession of rulers of contested origins produced anarchy. Diocletian (243 - 316) reinstated the Empire by 284. Rome regained territory until 395, when the Empire was so large that it had to be divided into two parts, each with a separate ruler. The two halves sat uneasily together. The East, which considered itself the heir of Alexander the Great, spoke Greek or a dialect, while the West spoke Latin. The Eastern Empire survived until 1453, but the system to maintain the Western Empire broke apart. Plagues and crop failures troubled the world. In 476, Germanic tribes deposed the boy who was then the Emperor. Roman roads fell into disrepair, and travel became difficult. Some memories remained in the lands which had once known Roman rule. The supreme rulers of various tribes called themselves king, a distortion of the Roman word Caesar. After Rome's fall, monks from Ireland (which had never known Rome) spread Catholic Christianity and the culture and language of the Western Roman Empire across Europe. Catholicism eventually spread through England (where the Germanic tribes of the Angles and the Saxons now lived)and to the lands of the post-Roman Germanic tribes. Among those tribes, the Franks rose to prominence. Charlemagne (742 - 814), the King of the Franks, conquered great portions of Europe. He eventually took control of Rome. The senate and the political organs of Rome had disappeared, and Charlemagne did not pretend to become the head of the Church. Charlemagne's domain, a confederation of what had been Roman Gaul with Germanic states, was much smaller than Diocletian had known. But prestige came with identity with the past, and so this trunk of lands became The Holy Roman Empire. Charlemagne's descendants, as well as local rulers, took their sanction from the Church, while the Church's pope influenced both religious and political matters. The result of political stability was technological advance. After the year 1000, Western Europe caught some of the East's discoveries, and invented others. In addition to vellum, Europeans now started making paper of rags or wood pulp. They also adopted the wind and water mill, the horse collar (for plows and for heavy weights), the moldboard plow, and other agricultural and technological advances. Towns came into being, and then walled cities. More people survived, and the knights and kings over them grew restive. 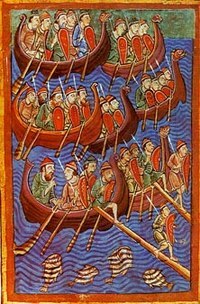 Danish seamen, painted mid-12th century. In the eighth century, pushed from their homes in Scandinavia by war and population expansion, Norsemen, or Vikings, began settling parts of the Faeroe, Shetland, and Orkney Islands in the North Atlantic. They went where ever treasure was, trading as far as Byzantium and Kiev in the East. In the West they raided from Ireland and England down to the Italian peninsula, sailing into a port, seizing its gold, and murdering or enslaving its people before fleeing. They began settling Iceland in approximately 874 CE. A Viking called Erik the Red was accused of murder and banished from his native Iceland in about 982. Eric explored and later founded a settlement in a snowy western island. Knowing that this bleak land would need many people to prosper, Eric returned to Iceland after his exile had passed and coined the word "Greenland" to appeal to the overpopulated and treeless settlement of Iceland. Eric returned to Greenland in 985 and established two colonies with a population of nearly 5000. Leif Erikson, son of Erik the Red, and other members of his family began exploration of the North American coast in 986. He landed in three places, in the third establishing a small settlement called Vinland. The location of Vinland is uncertain, but an archeological site on the northern tip of Newfoundland, Canada (L'anse aux Meadows) has been identified as the site of a modest Viking settlement and is the oldest confirmed presence of Europeans in North America. The site contains the remains of eight Norse buildings, as well as a modern reproduction of a Norse longhouse. But the settlement in Vinland was abandoned in struggles between the Vikings and the native inhabitants, whom the settlers called Skraelingar. Bickering also broke out among the Norseman themselves. The settlement lasted less than two years. The Vikings would make brief excursions to North America for the next 200 years, though another attempt at colonization was soon thwarted. By the thirteenth century, Iceland and Greenland had also entered a period of decline during the "Little Ice Age." Knowledge of their exploration, in the days before the printing press, was ignored in most of Europe. Yet the Vikings are now considered the true European discoverers of North America. The influence of their people outlasted even the terrible raids, and their grandchildren became kings and queens. For example, a branch of Viking descendants living in France, the Normans, conquered England from the Anglo-Saxons in 1066. The Little Ice Age led to European famines in the years 1315-1317 and in 1321. In the year 1318 sheep and cattle began to die of a contagious disease. Farmers could not support the growing population. And then, in 1347, some Genoese trading ships inadvertently brought a new, invasive species of rat to Europe. These rats carried bubonic plague. Plague was also called the Black Death, from the darkened skin left after death and from its deadly reach. It had three strands: bubonic, pneumonic, and septicemic. In bubonic plague fleas carried by the rats would leave their hosts and bite people. The masses of bacteria would flow through the human system, killing cells and leaving their refuse in lymph nodes in the armpit, groin, and neck. These nodes would swell and turn black, creating bubos. Infection could also spread into the lungs, so that a person might cough or sneeze the germ into the air. This created pneumonic plague, spreading disease into spaces where people gathered and where rats dared not go. It also spread through contamination of food. The last form of disease, and its most deadly, was septicemic. This attacked the blood, leaving stretches of pale skin looking black, and killing the person within hours. Surviving laws of cities and guilds regulate public cleanliness and penalize adulteration of food. They cannot show how strictly these laws were applied. And they show no knowledge, of course, of germ theory and the need for sterilization. Older systems such as the few public baths which remained from the days of colonial Rome were seen as sinful and dangerous, invitations to the plague. The dwelling places of survivors of pre-Christian Rome, the Jews who were forced to live apart, were attacked by mobs who attributed the Black Death to their poisoning Christians' wells. The responses to plague can be seen in the records left by survivors -- one third of the population of Europe died in repeated waves of disease -- and in the subsequent changes in society. Airplanes and satellites show the foundations of plague-era towns which were emptied by the disease. In just one square mile of pre-plague Europe there are reports of there being 50,000 people. In large cities, families would flee or lock themselves away, trying to keep themselves from death. Other families were locked in by city authorities. This is the beginning of the modern system of quarantine. Some branches of the family would not be among those so helped. The Black Death seemed erratic, sometimes taking people deemed good and pious, sometimes not. One priest or church prelate might die, and another survive. And a living priest might give no aid to other survivors. Some critiques of the Church which had become spread through most of Europe date from this era. Although some lands became waste through lack of tilling, those people who survived grasped the property of those who had not. Europe then had a land-based economic system. Rich people became richer. There began a labor shortage: the farmers who survived needed hands to take in their crops. The wages of farm hands began to rise. In the surviving towns they needed people to guard the gates: in the courts they began to look for rising young men. Cities became more powerful in the depleted lands, and authority grew more centralized. During the Middle Ages Western society and education were heavily shaped by Christianity as expressed through the Roman Catholic Church. Towns, courts, and feudal manors had their priests, monasteries and nunneries had their scriptora or libraries, and after the 11th century CE, a few cities had Universities, schools to educate men to be high-ranking clerics, lawyers, or doctors. Where children had schools, their parents paid a fee so that they might learn Latin, the language St. Jerome had used for his translation of the Bible. Latin was the language of the Church. It was also learned, along with military tactics and the rules of chivalry, by men who trained to be knights. A smattering of Latin was necessary, along with Math, even for the elementary schools which sprang up in some cities. There both boys and girls were taught literacy and math, prerequisite for acceptance as an apprentice in many Guilds. Latin across Europe created a European-wide culture: a doctor from Padua could talk to his fellow from Oxford in Latin. As in the Greek and Roman eras, only a minority of people went to school. There were not enough books, little travel, and no means of spreading standardized education. Schools were attended first by persons planning to enter religious life. Occasionally a cleric would reach out to educate a very bright peasant boy. This was one of the few ways peasants could rise in the world. But the vast majority of people were serfs who served as agricultural workers on the estates of feudal lords. They were, in effect, tied to the fate of the land. From the serf up to some high princes, the vast majority of people did not attend school, and were generally illiterate. In the rise of the Universities in the 11th century, the Church translated several manuscripts of the ancient Greek writer Aristotle into Latin. From Aristotle's emphasis upon human reason, philosophy and science, and the Church's emphasis upon revelation and the teachings of Christ, medieval scholars developed Scholasticism. This was an philosophical and educational movement which attempted to integrate into an ordered system both the natural wisdom of Greece and Rome and the religious wisdom of Christianity. It was dominant in the medieval Christian schools and universities of Europe from about the middle of the 11th century to about the middle of the 15th century, though its influence continued in successive centuries. The idea of Man in the middle of ordered nature, and yet dominant over nature, bore fruit in the observation of natural phenomena, the beginnings of what the Western World knows as science. It also led to the exultation of system over observation, and the persistence of the Ptolemaic theories such as geocentrism among formally educated people. Noble girls were sometimes sent to live in nunneries in order to receive basic schooling. Nuns would teach them to read and write and the chores necessary to run their establishments, including spinning and weaving. (Cloth-making was a major national industry in the Middle Ages.) They taught them their manners and their prayers. Some of these girls later became nuns themselves. During the centuries after the fall of Rome, various flavors of Christian churches spread from Northern Africa and Armenia westward. This changed after Mohammed established Islam in 610 CE. Like Christianity, it spread through conversion and conflict. At its height it was also a faith of Europe, from Spain to Albania and Bosnia and their sister states. Both Prince and Caliph held that their state must have one faith, and no other belief was encouraged. When Jerusalem was reconquered by the Seljuq Turks, Christians were no longer able to go on religious pilgrimages to the Holy City. At the end of the eleventh century, Pope Urban II inaugurated the Crusades, urging Western European kings and great nobles to begin what would be a century and a half of warfare. Christian armies fought first to reconquer and then to hold part of the Kingdom of Jerusalem. The Crusaders ultimately failed in the face of resurgent Muslim forces. Western Europeans within Church and State argued for and against the Crusades. Despite the failure of the Crusades, militant Western Christianity persisted in Spain in an effort known as the Reconquista (the "reconquest"), which purged the land of the Muslims who had arrived there in 711. By the fifteenth century, the Muslims were confined to the kingdom of Granada, which bordered the Mediterranean Sea in the southern side of the Iberian Peninsula. Granada finally fell in 1492 to the Spanish Christians, ending the reconquista. Rome had destroyed Israel in 70 CE, but allowed a remnant of her people to survive. Fortified by rabbinic culture and centered on the Torah, they became a resilient group. They survived as the known world became Christian. They spread, as traders, through East and West. However, Christian relationships with Jews were punctuated by hatred. They were held to be guilty of Jesus' death, and they were supposed to be evil because they had not converted to Christianity. They were forced into the notorious ghettos, usually built on waste or undesirable land. They were forced to wear strange clothing which marked them off, and to pay heavy taxes. Christians spread rumors that Jewish officials sometimes kidnapped and killed young boys for their sacrifices. Sometimes a mob might break into the ghetto, killing some people. Individuals were sometimes forced to convert. One of the effects of European nationalism was the expulsion of a country's Jewish population. England was the first, in the 13th century; later, a reviving France; later still, Spain and Portugal. Some men crewing the ships in the Age of Exploration were Jews, often practicing their faith in hiding. For a period in the late Twelfth century there two sets of Popes, a line in Rome and another in the French city of Avignon under the sway of that Court. In reaction against this, the Church centralized its powers in parallel to what nations were doing. There had been dissension before, in medieval England's Lollards and later with the Czech priest John Hus. However, it was only in an age after the printing press, when people began printing the Bible in their own languages, when Martin Luther founded the Protestant church. England's King Henry VIII, who had won the title "Protector of the Faith" for a work defending the Pope, later left it to become the head of the Church of England. This division of Western Christianity created religious minorities, who were persecuted throughout Europe. Among these were the Pilgrims, who helped settle America. Another, more humble result of the plague was the accumulation of rags left over from clothing. These were quickly used to make paper. Books were very rare during the Middle Ages, and the monks who made them chained them to their shelves. It took one year for a man to make one book. In that climate Bibles took priority: we have only one copy of Democritus's most famous work surviving from this period. As rag paper replaced velum, books began to become more plentiful. The supply was augmented by Europe's adoption of Johannes Gutenberg 's fixed-type printing press in the 15th century. There had been earlier leaps in culture, including the wave of population and technological adaptation in the 12th century. This left its mark in increased population and the Roman Catholic Church's adoption of Aristotle. Yet the press made it possible for knowledge to have a foothold in society. Inventions in one place could be explained and adopted across a continent. The Greeks fleeing the fall of Byzantium brought their knowledge of ancient Greek culture to the West. The Bible, the basic book of Christendom, could be pored over by laypeople, and reading it could be learned by more people than ever before. Learning was no longer solely the province of the Church. If the Bible was first off of the presses, pseudo-science and science followed soon after. The European witch trials were one result of the new medium. The questioning of scientific consensus was another. Andreas Vesalius published his observations about the circulatory system. Books discussing the theories of Nicolaus Copernicus and Galileo Galilei demolished the old geocentric theory of the cosmos. The arts were not neglected. Giorgio Vasari's biographical Lives introduced such new artists as Leonardo Da Vinci and Michelangelo Buonarroti to the larger world. A later time called this growth of knowledge the Renaissance. They said it began in the Italian city-states, spreading throughout most of Europe. The Italian city of Florence was called the birthplace of this intellectual movement. Books spread the Crusader's newly found experience and knowledge of the Mediterranean, a region whose technology was at that time superior to that of western Europe. Books written about traders, adventurers, and scholars spread knowledge of Chinese technology such as gunpowder and silk. They spread writings of the ancient world which had been lost to Europe, and nurtured a taste for new foods and flavors. They spread pictures of ancient Greek statues, Moorish carpets, and strange practices. In the fifteenth century, the Mediterranean was a vigorous trading area. European ships brought in grains and salts for preserving fish, Chinese silks, Indian cotton, precious stones, and above all, spices. White cane sugar could be used to preserve fruit and to flavor medicine. Cinnamon was medicine against bad humors as well as preservative and flavoring, part of the mysterious poudre douce, and now available even to some European common people. The great age of exploration was undertaken by nation-states, cohesive entities with big treasuries who tended to use colonization as a national necessity. When such nations as Portugal, England, Spain, and France became stronger, they began building ships. The Italian peninsula dominated the world because of its position in the Mediterranean Sea. Universities in Padua, Rome, and elsewhere taught men from East and West. Above all, principalities such as the Republic of Venice and Florence controlled trade. Genoa and Venice in particular ballooned into massive trading cities. Yet there was at yet no nation of Italy, so each city's riches belonged only to that city. Individual cities used their monopoly to raise the price of goods, which would have been expensive in any case, because they were often brought overland from Asia to ports on the eastern Mediterranean. The mad prices, in turn, increased the desire of purchasers to find other suppliers, and of potential suppliers to find a better and cheaper route to Asia. Portugal was just one of many potential suppliers, with a location which extended its influence into the Atlantic and down, south and east, to Africa. Prince Henry, son of King John I, promoted the exploration of new routes to the East. He planned Portugal's 1415 capture of Ceuta in Muslim North Africa. He also sponsored voyages that pushed even farther down the West African coast. By the time of his death in 1460, these voyages had reached south to Sierra Leone. Under King John II, who ruled from 1481 to 1495, Bartolomeu Dias finally sailed around the southernmost point of Africa to the Cape of Good Hope (1487-1488). In 1497-1499 Vasco da Gama of Portugal sailed up the east coast of Africa to India. The Portuguese colonized and settled such islands in the Atlantic as Madeira, Cape Verde, the Azores, and Sao Tome. These islands supplied them with sugar and gave them territorial control of the Atlantic. West Africa was more promising, not only unearthing a valuable trade route to India, but also providing the Portuguese with ivory, fur, oils, black pepper, gold dust, and a supply of dark skinned slaves who were used as domestic servants, artisans, and market or transportation workers in Lisbon. They were later used as laborers on sugar plantations on the Atlantic. King Harold of England faced William the Norman usurper after defeating the last Viking forces holding the North of England. And when William the Norman became William the Conqueror, he held England by consolidating the nation. His army was ruled from newly built castles, and had the best technology of the time. His sons and their sons fought the original inhabitants of their country in Scotland and Wales, pushing their boarders. They also claimed the right to their ancestral Normandy, in what is now France. (There had long been rivalry between England and France over the wool trade.) By a English king's marriage to an former queen of France, Eleanor of Aquitaine, the king subsequently claimed Aquitaine. During the years of 1337 to 1453, the kings of England claimed the whole of France and beyond, fighting The Hundred Years' War there and in the Low Countries. For some years the English threatened Paris, and there was a question whether the small area of France proper would be entirely conquered. The early stages of the war marked by English victory against a demoralized French people and their Prince. But around 1428, a young peasant girl from Lorriene, France named Joan of Arc approached a garrison of the French army. She told them that Saint Michael, Saint Catherine, and Saint Margaret had told her to lead the army to victory. She said that God had come to her in a dream, and told her how to defeat the English. She claimed that God said Prince Charles of France needed to be crowned in order for France to claim victory over the English. After gaining the new French king, support of the populace, and several key victories, Joan was sold to the English for treason and as an appeasement. Yet France had been renewed. It pushed back against the invaders, and took back most of the land. In the next few centuries it was to remove England from Continental Europe. The Hundred Years' War devastated both countries. But it ultimately turned both of them into stronger, colonial powers. The Hundred Years' War created opportunities for wealth and advancement for the knights of both countries. The Chivalric code showed great influence during this period. France absorbed Aquitaine, Castile, and Normandy itself, prosperous areas. The twin strokes of the plague and the Inquisition weakened opposition to the French king's rule. And English centralization continued as its own royalty sought service of serf and Baron. A group of new dialects, Middle English, came out of the tug between Norman lord and Anglo-Saxon peasant. If the nation could not get new land in Europe, it could use its ships to sail elsewhere. 1. Explain how one of these late medieval devices affected prosperity: the wind mill; the horse collar; the printing press. 2. How did the plague infect individuals? How did mass death affect society? 3. What was the importance of these four men to the Renaissance? Galileo Galilei, Nicolaus Copernicus, Andreas Vesalius, Leonardo Da Vinci. ↑ Gottfried, Robert S. The Black Death: Natural and Human Disaster in Medieval Europe. Simon and Schuster, 1985. 64. ↑ Hunter, Susan S. Black death: AIDS in Africa. Palgrave Macmillan, 2003. 115. ↑ (Charing pg. 18-23). Charing, Douglas. Judaism. New York, NY: DK Pub., 2003. This page was last edited on 10 November 2018, at 21:39.